Tram routes 2 and 3 will be diverted 1-14 August due to construction work conducted at the Vauhtitie intersection on Nordenskiöldinkatu. 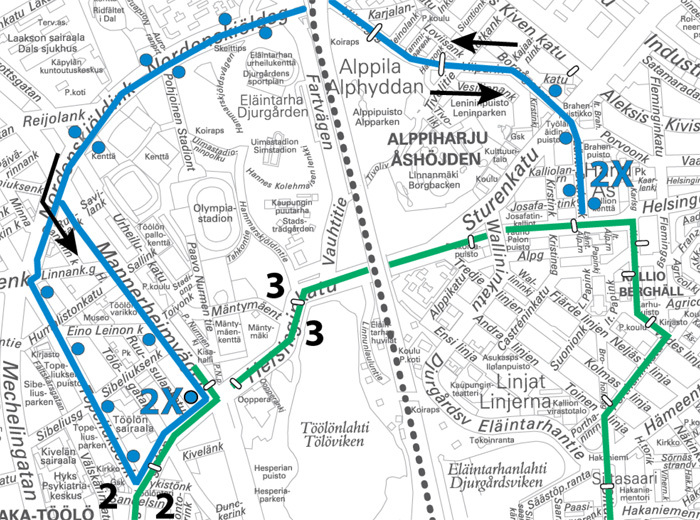 Bus 2X will replace the trams in Alppila and Taka-Töölö. Tram 2 will run from the Opera House via Töölö to Eira. By the Opera House, the tram will use the “Ooppera” 0241 stop. Tram 3 will run from the Opera House via Kallio to Eira. By the Opera House, the tram will use the “Ooppera” 0108 stop. Bus 2X will take the following route: Runeberginkatu, Topeliuksenkatu, Nordenskiöldinkatu, Viipurinkatu, Läntinen Brahenkatu, Viipurinkatu, Nordenskiöldinkatu, Mannerheimintie, Runeberginkatu. The bus will serve all bus stops along the route.